DataMatrix codes quite frequently face challenges related to readability when used in industrial environments. 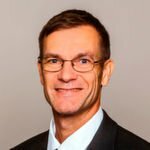 At the Hannover Messe, laser marking specialist ROFIN and VisionTools introduce a new, perfectly tuned solution for laser marking and code recognition. ECCI ("Error Correcting Code - Industrial") uses an innovative 2D coding, which has been developed from scratch to meet the specific requirements of industrial marking applications. With its far greater robustness compared to other DataMatrix codes, ECCI is a promising option for numerous marking applications in industries like automotive, machine tool, medical devices, packaging, photovoltaics or aerospace engineering. The well-known DataMatrix code was originally designed to be printed on paper. But flat, homogenous, nonreflecting surfaces which can be marked with high contrast are not the standard application in industrial manufacturing. Quite frequently, marking areas are tiny, they show unfavorable aspectratios or they are curved. 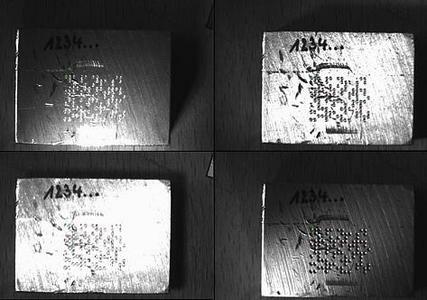 Inhomogenous or reflective materials or substances which only allow lowcontrast markings add to the readability problem, as well as wear and tear and damages. Therefore code recognition and especially the required lighting can be complex and challenging. In contrast, the new ECCI code was specifically designed and fieldtested for industrial marking applications and their requirements. Unlike the ECC 200 code, the ECCI code uses differential decoding and majority decisions. Thus the code is highly resistant against changing contrasts, often found on inhomogenous or curved surfaces. As long as anything is visible decoding works - even in case of contrast inversions within the marking. Markings on cylindrical parts like medical devices or implants are easily readable as well as on polycrystalline solar cells or multicolored packaging foils. Whereas the ECC 200 code uses a fixed aspectratio of 1:1 or 1:2 the new code offers virtually any aspectratio up to the point of onedimensional coding. Even tiny, elongated marking areas, for instance on highpower LEDs, can be utilized completely. This allows for bigger marking spots and hence for most robust and costeffective marking solutions. ECCI code redundancy is adjustable (ECC 200 has a fixed redundancy of 30%). Markings which might be subject to damage or heavy wear and tear, can use a highly redundant coding. Already today, containers of hardening machines in casting houses are marked with ECCI. Within local areas the new code always marks a defined percentage of spots. Unlike ECC 200 it needs neither finder patterns nor quiet zones. ECCI markings show an unremarkable, homogenous appearance and can be placed next to other markings. In addition, the great coding flexibility offers best prerequisites for forgerysafety applications. Contrary to other innovative coding options, marking with ECCI is royalty free. And recognition with VisionTool's wellestablished standard software V60 requires no extra license as well. The cooperation of ROFIN, a marketleader in industrial laser marking, and VisionTools, one of Germany's leading suppliers for industrial image processing and originator of the code, allows for perfectly tuned solutions based on the new ECCI code. 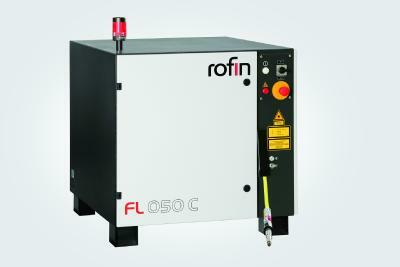 ROFIN offers a comprehensive range of marking lasers, from end- and transversallypumped solid state lasers, to fiber lasers, to CO2 and picosecond lasers. In combination with a wide choice of optics and handling systems, there is an optimum marking solution for any material and any geometry. 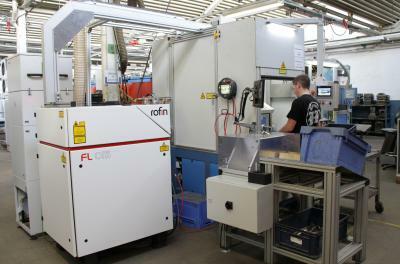 A mark inspection system for immediate readability verification can be added. This verification assures correct and consistent markings. Together with differential decoding this is the prerequisite for perfect future readability. ROFIN-SINAR Technologies Inc. (ISIN US7750431022): Wirksamwerden des Zusammenschlusses mit Coherent, Inc.